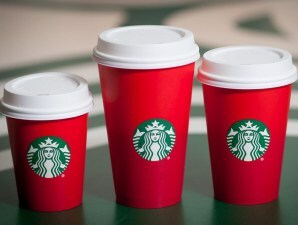 You may have heard the recent backlash on popular coffee chain Starbucks about their holiday red cups. In years past, the coffee giant included holiday-themed images on their cups. However, after receiving numerous complaints the chain decided enough is enough and this season is only producing red cups. In turn, coffee-drinking Christians have been in an uproar because of the lack of Christmas cheer on their favorite cups. Even presidential candidate and comedy central roast participant Donald Trump agrees that Starbucks hates Christmas. Now it may be silly, what does it matter if there is a glass globe or a glorified caribou on my latte cup? Well, it does matter. While it is true that most Americans are Christian, about 75%, that’s still a whole quarter of our population that isn’t being represented. As someone who is not religious, but celebrates the secular parts of Christmas, I can agree that we must respect all religions, especially around the holidays. With December a few weeks away, we might all need a helpful reminder on why it is so important to be respectful during this season. Here are some tips on how not to be a jerk about Christmas during the holiday season and be respectful for all religions. Don’t snap at your cashier when they say “Happy Holidays” instead of “Merry Christmas.” It’s very likely that that is their company policy; it is also very likely they do not celebrate Christmas. Most of all, they probably don’t want to be serving red Starbucks cups to you in the first place, they want to be home with their family on Black Friday like everyone else. This also includes commenting on a store’s lack of decorations. Once again, some companies really don’t decorate for holidays, it’s not a war against Christmas. Don’t brush off your significant other’s offer for you to attend a holiday religious service. I can’t lie; I’ve been guilty of this. During Easter, my boyfriend asked me if I wanted to go to church with him and his family. At first I kind of scoffed at it. I’m not religious at all; however, I figured it meant something important to him and his family. It was a really nice service and I was honored to be able to spend time with his family in that way. I also got a pretty sweet Easter basket from his mom afterwards. Don’t make assumptions about how anyone celebrates a holiday. I remember in High School when kids would comment to their Jewish peers how awesome it must be to get eight days of presents for Chanukah. You know what else is awesome? Being bombarded from Nov 1st to December 25th with Christmas-themed everything and you don’t even celebrate it. Also don’t get snooty with non-Christians celebrating aspects of Christmas. For one, Santa is more pagan than anything; and two, every family celebrates holidays differently. I know I’m not the only kid that got chocolate coins with menorahs on them in my stocking. Do include everyone in your Secret Santa in your office. Presents are presents! Seriously though, the holiday season’s main theme is celebrating those around you whom you love and appreciate. If you know there are staff members who do not celebrate Christmas, don’t feel awkward about asking if they want to be involved with office holiday fun. Go the extra mile and ditch the name Secret Santa and start a Grab Bag or White Elephant. Any holiday-related activities at work should be inclusive to all. Make sure you don’t plan your holiday office party on another important holiday in the month or focus just on Christmas when decorating and selecting food and music. Do acknowledge that not everyone likes Christmas. Even if you are Christian, you may not like Christmas. Some people hate Christmas. For example, my father hates Christmas. I can’t blame the man…he shares a birthday with Jesus. The holiday season is also a very hard time for people. Seasonal Depression is a real thing and affects about 20% of the population. So when someone begs you to not play Dominick the Donkey for the eighteenth time, don’t be rude, you may be contributing to their personal hell. Do bring some peace to the world. Spouting hate and conjuring all this energy to defend Christmas from non-Christians isn’t the reason for the season. If you don’t want to support Starbucks, fine, spend that money for your venti double mocha skim milk steamed whatever donating to a charity. As said in the last point, the holiday season can be hard for many, emotionally and financially. Do your part in helping someone during the holidays, it’ll give you that Hallmark movie warm fuzzy Christmas feeling, I promise. The holiday season is a time to show love to those around you. Respect each other, love each other, and have a happy new year. Previous Post: « Is Now the Right Time to Start my Own Business?